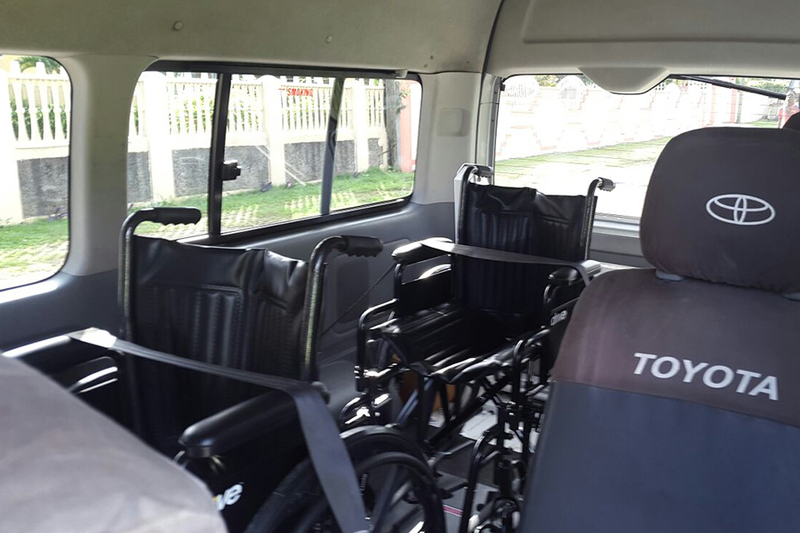 Seats up to 7 persons plus the wheelchair passenger for tours and excursions. Seats up to 4 persons plus the wheelchair passenger with luggage for Airport transfers. 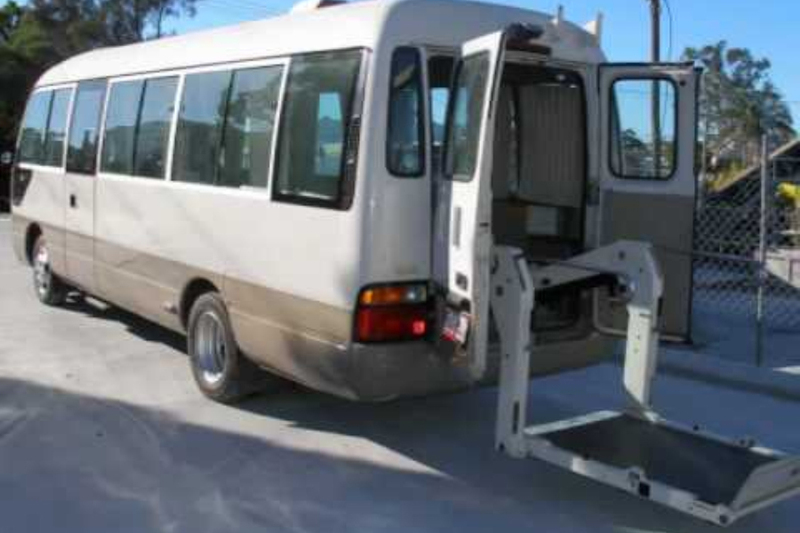 The wheelchair passenger is lifted up into the van hassle free and transported while siting in the wheelchair. The wheelchair is firmly secured while the wheelchair passenger is seated and being transported, the wheelchair passenger is also secured by seat belts while being transported. 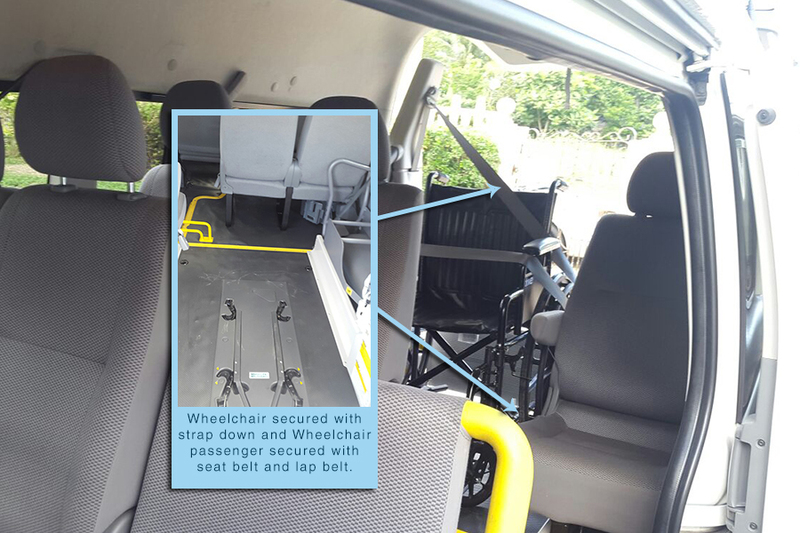 There is also an option for the wheelchair to be folded and stored while the passenger is being transported. 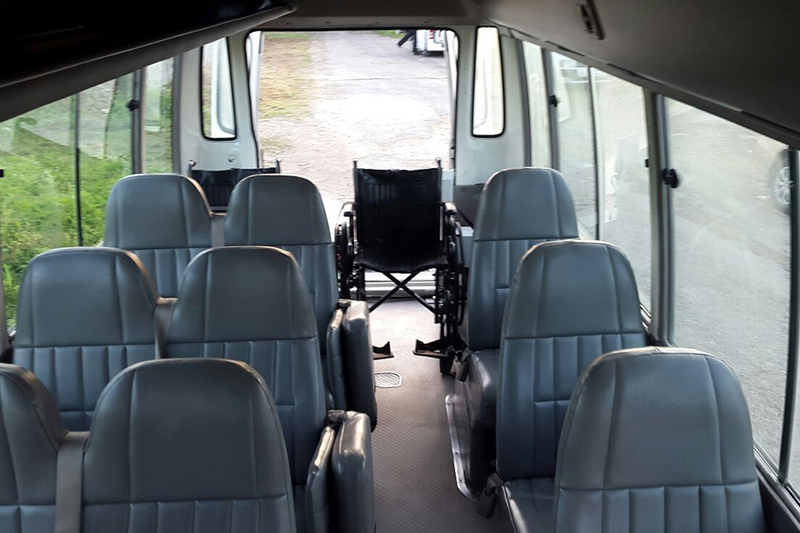 Seats up to 8 persons plus one (1) wheelchair passenger for tours and excursions. 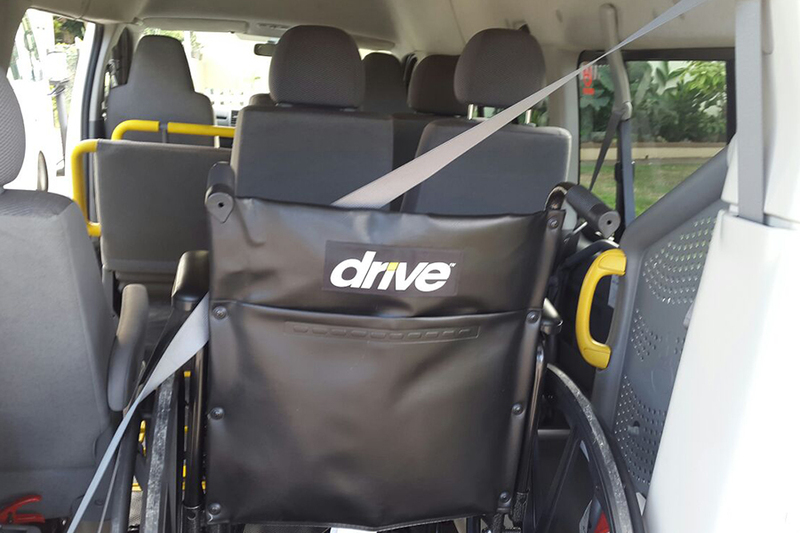 Seats up to 6 persons plus two (2) wheelchair passengers for tours and excursions. Seats up to 6 persons plus one (1) wheelchair passenger and luggage for Airport transfers. Seats up to 4 persons plus two (2) wheelchair passengers and luggage for Airport transfers. 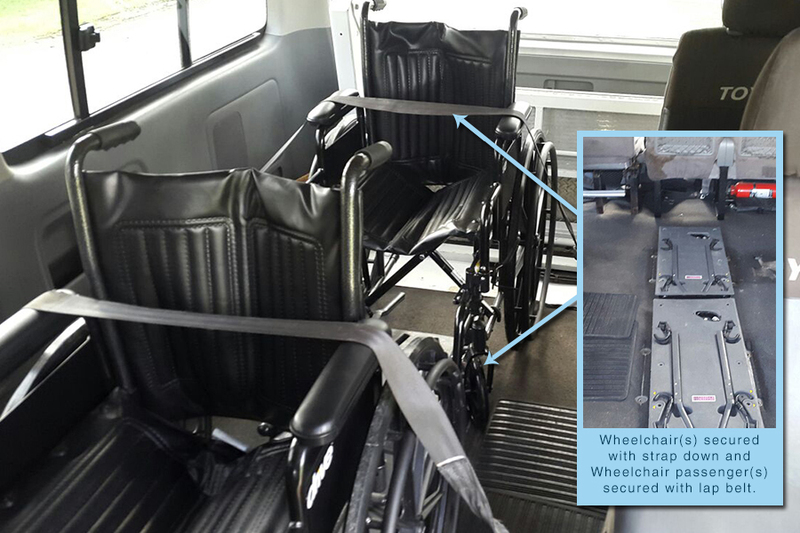 The wheelchair passengers are lifted up into the van hassle free and transported while sitting in their wheelchair(s). 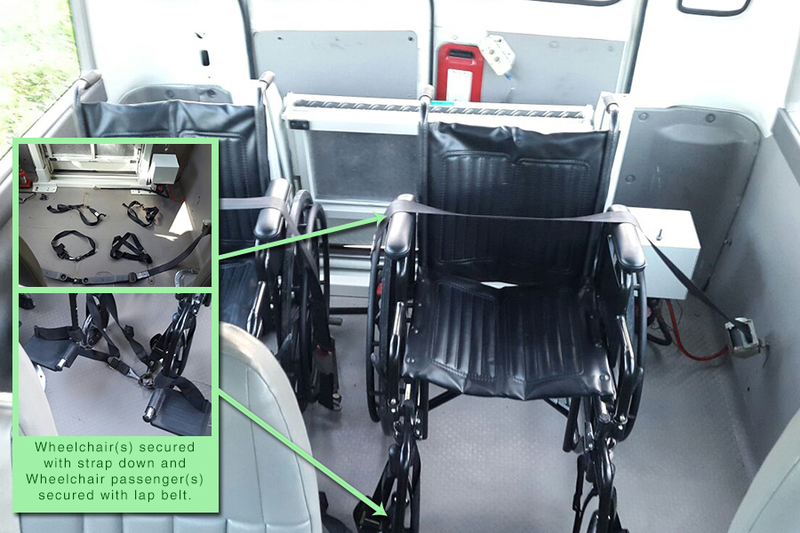 The wheelchair(s) are firmly secured while the wheelchair passenger(s) are seated and being transported, the wheelchair passenger(s) are secured by lap belts while being transported. 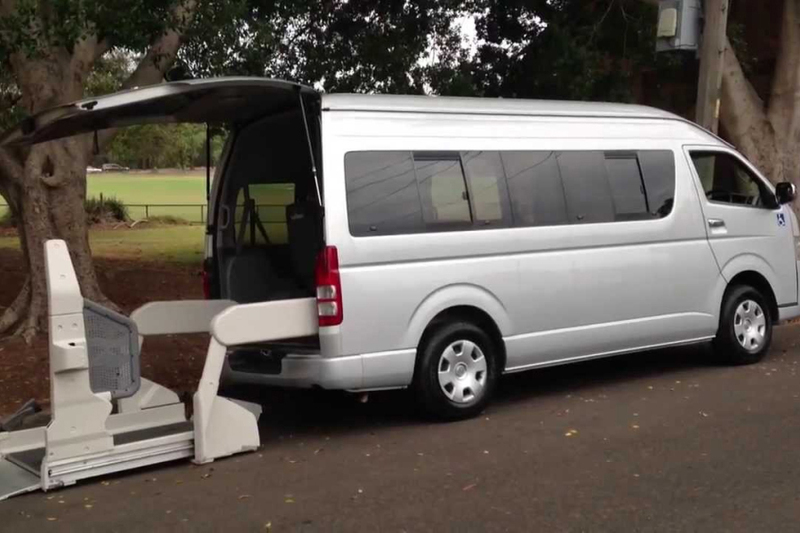 There is also an option for the wheelchair(s) to be folded and stored while the passenger(s) are being transported. Seats up to (15) persons’ plus (1 or 2) wheelchair passengers for tours and excursions. Seats up to (10) persons’ plus (1 or 2) wheelchair passengers with luggage for Airport transfers. The bus is equipped to carry one (1) or two(2) wheelchair passengers, but can easily be adjusted to accommodate up to three(3) wheelchair passengers at an additional cost. For groups over 11 or more persons doing Airport transfers, we recommend an additional van to assist with luggage for Airport transfers at an additional cost. The bus or van with driver is available for 10 hours per day. However, the hours do not have to be consecutive; they can be broken, using some in the morning and the rest late evening to facilitate those wanting to go out at nights. Overtime can be negotiated if guests need to extend the 10 hours. The hours are not carried forward to the following day. Additional payments for overtime hours over this period are to be paid directly to the driver. If the driver is expected for late night driving, he should start his work day later. Please discuss with the driver your travel plans for the day/week. Unlimited airport transfers from MBJ, more than one airport transfers on the same day would be at an additional charge if there isn’t enough turnaround time from the villa to the airport between flights. Unlimited trips and tours, you may drive anywhere and anytime you desire, no restrictions. When you rent the bus/van and driver package for the week, your first tank of gas is complimentary, additional gas purchase would be at clients’ cost when required. The rates do not include the suggested gratuity of 15% to the driver. 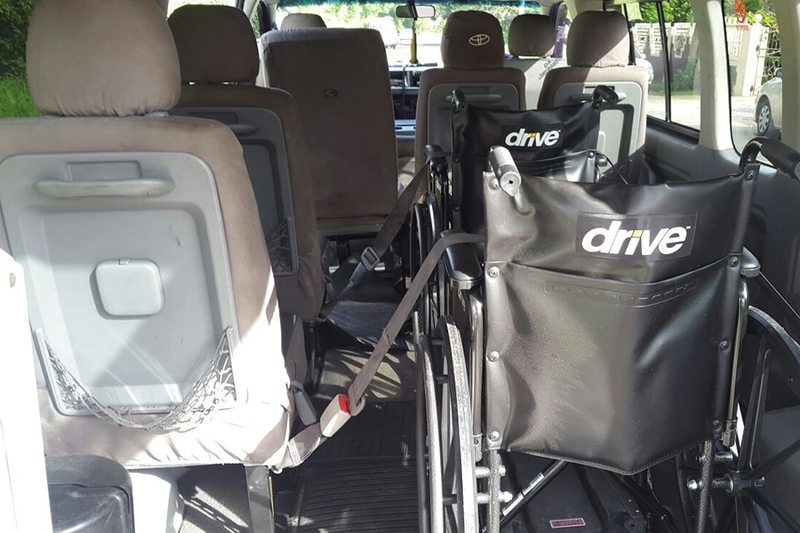 -For persons using the 10-seater Wheelchair Accessible van and have groups over 6 or more persons doing Airport transfers, we recommend an additional van to assist with luggage for Airport transfers at an additional cost. Special requests: Infant seats, child car seats and booster seats are available on request at US$5.00 per day or US$40.00 per week per seat. Please note: A minimum of 4 days is required for a private van/bus with driver package and the day rate. If clients take a van/bus with driver package for 4 days it includes the driver for the 10 hours a day and multiple transfers from MBJ (as long as the driver has enough turnaround time between flights from the villa to the airport). Unlimited trips and tours, you may drive anywhere and anytime you desire, no restrictions. Clients also get one tank of gas complimentary and are required to purchase any additional gas a required. The rates do not include the suggested gratuity of 15% to the driver. Seats up to 4 persons plus the wheelchair passenger and luggage for Airport transfers. 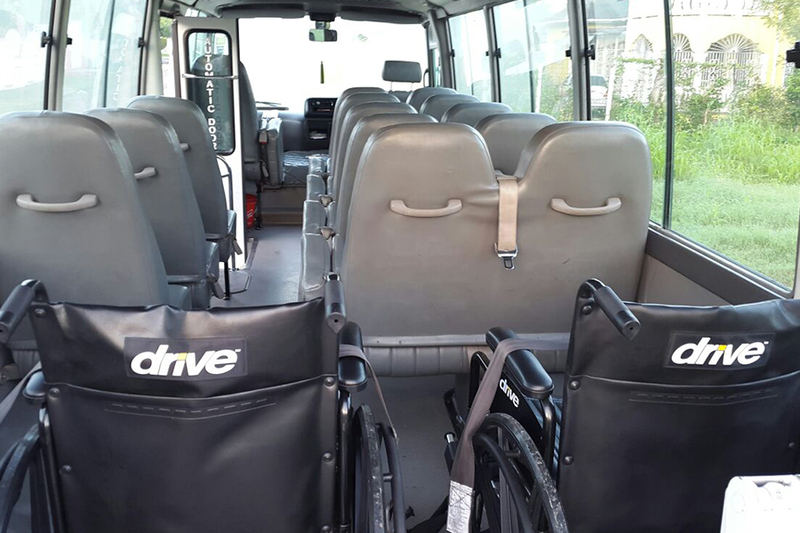 Seats up to 6 persons plus two(2) wheelchair passenger for tours and excursions. Seats up to 4 persons plus two(2) wheelchair passenger and luggage for Airport transfers. Seats up to (15) persons plus (1 or 2) wheelchair passengers for tours and excursions. Seats up to (10) persons plus (1 or 2) wheelchair passengers with luggage for Airport transfers. 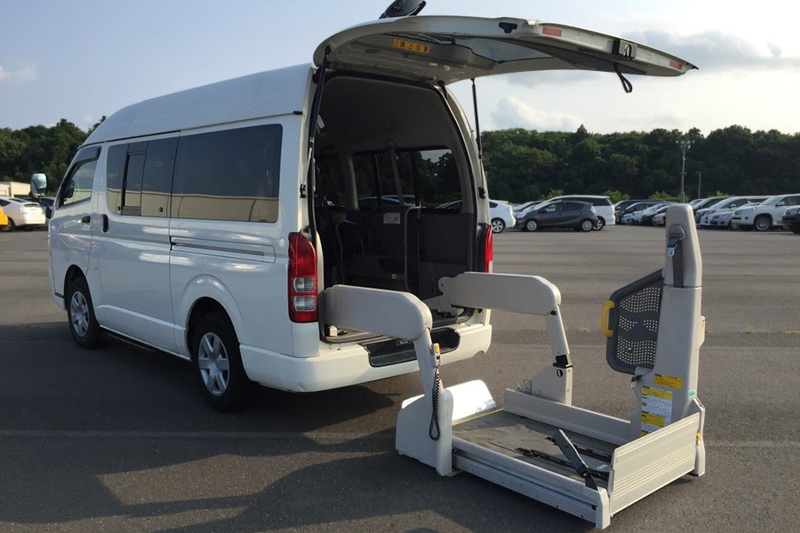 The bus is equipped to carry one(1) or two(2) wheelchair passengers, but can easily be adjusted to accommodate up to three(3) wheelchair passengers at an additional cost.